Dr. Wheatgrass ‘Play of the Day’: Muneeb takes 18 off the 16th over of the chase (including two big sixes) to effectively seal the deal for the Sharks! After a bright resurgence in the Japan Cup on the back of two victories on the trot, including a last-ball thriller against the Falcons, we now found ourselves in the semifinals with high expectations. A win here would mean an automatic spot in the National Finals. The only problem? We were up against the team who had last beaten us in the competition, Nippon Tigers. Oh, and we were 10 men playing in brutal 39 Celsius heat. Not to mention that as many as six of us had been in Sano for cricket on the previous day too. And so, with the odds stacked against us, compounded by the fact that we would be fielding first, we embarked on our quest to go back to the National Finals for the first time in three years. Due to Sano 4’s infamous trait of having too many balls lost at the straight boundary from one end, it was decided to play from only one end. While this resulted in less walking around in the stinking heat and humidity, it also meant that the bowlers would have very short boundaries on all sides except behind the wicket, and hence, very little margin of error. Captain CT started things off with Muneeb, who started off very tight but strayed his line on the last ball, which the opener Saki duly put away to the boundary. Sharing the new ball was Neel. The other opener, our very own Rakib, looked to hit every ball to the leg side, and succeeded in sweeping one ball for four, but then fell caught behind immediately as Neel finally managed to get one to stay on the off side on the last ball of his over. Muneeb followed that up with a maiden. Quiet start, Nippon Tigers 9-1 after three. However, the new batsman, Habib, came in with intent to find the boundary, and took Neel for 17 off the next over, inserting impetus into the Tigers innings. The change bowlers, Awal and Marcus — who has quickly gained the reputation of taking big wickets when his team needs them — were generally accurate, but offered one boundary ball an over which the batsmen duly put away. After 8 overs, the score stood at 58-1 and we sensed that we needed an opening. The fast bowlers, however, were tiring in the sapping heat. With this in mind, CT decided to bring on the twin-spin threat of Krishna and Mahesh. Also around this 8-over mark, the opening batsman retired ill due to heat exhaustion. Could this be the opening we were looking for? Indeed. Krishna bowled a quiet over, and Mahesh reaped the fruit in his very first over, scalping Habib, who departed for a well-made 38 off 20 balls. The spinners kept up their good work, their next four overs in tandem seeing five wickets for only about 20 runs. These included the big wickets of Bhutto (bowled Krishna) and the Sharks’ own Gaurav (c&b Mahesh). This spell of play sucked out the momentum from the Tigers’ innings, and although Saki (42 off 40), the retired batsman, returned to strike a few meaty blows at the end, they could only make their way to 140, which considering the dimensions of the ground, seemed slightly below par. The stars of the show were undoubtedly Mahesh (3-16) and Krishna (3-22). We knew all we needed to do to chase down 141 on a small ground was to occupy the crease and play risk free cricket. Atharva and Marcus were sent out with this aim. They quickly started to demonstrate why they are arguably the most successful opening partnership in Japanese junior cricket. Marcus feasted on anything short and sent it to the ropes, while Atharva scored the ugly runs that are often missing from Sharks innings, nudging singles and rotating strike. A generous offering of wides meant that we were on par with the required rate after 5 overs. Ideal start to our pursuit. With Marcus having settled, he looked to accelerate but fell, failing to clear mid off. Nevertheless, he had done his part, scoring 19 in as many deliveries. In next was Sankar. He wasted no time in getting in, smoking a six off just the third ball he faced. 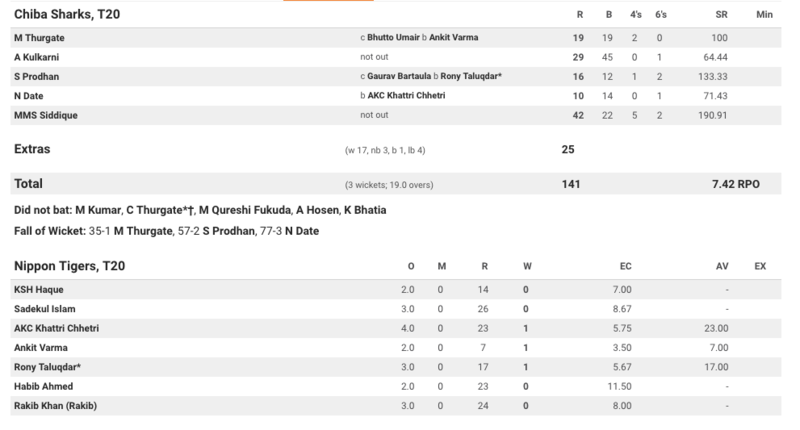 Meanwhile, Atharva at the other end was looking solid as a rock, soaking up all the pressure from the bowlers and letting Sankar do the damage, which he promptly did with two more boundaries. Just when it looked like we were creeping ahead of the game, the leader of the Nippon Tigers attack, Rony, got the prized wicket of Sankar, caught by the safe hands of Gaurav. Neel went in to the middle next and worked the ball around cautiously for singles, with Atharva still looking as comfortable as ever. The pair made it to the 10-over drinks break unscathed, and with the score standing at 63-2, the match was well and truly in the balance. 16 runs came off the next two overs, with Atharva and Neel each hitting one six, but the latter completely missed a ball from the impressive left-arm spinner Abhishek while trying an almighty heave to have his woodwork rearrranged. The number 5 batsman was Muneeb. The opposition spinners continued to be tight. The next three overs yielded 11, leaving us with the daunting prospect of needing 51 to win from 5 overs. Enter Muneeb’s beast mode. Taking a liking to the part-timers, Muneeb decided to launch. In what was definitely the turning point of the match, he single-handedly took 18 off the 16th over, targeting the square leg fence. This brought the equation down to 33 required from 24. What seemed like a tough ask a mere six balls ago now seemed very gettable. Muneeb’s onslaught from one end injected confidence into Atharva too, who continued to be unwavering despite having been out in the sun for the entirety of the match so far. The two began to take advantage of the tired fielders, running rapidly between the wickets, exposing the significant gap in fitness between the two teams. With 18 more coming off the next two overs, a win seemed apparent now. All we had to do was to knock off 15 runs from 12 balls. With tensions rising in the fielding side, Muneeb and Atharva achieved this with minimum fuss, taking only six balls to reach the target. This sparked wild celebrations in the Sharks dugout, who were obviously overjoyed at our miraculous turnaround this season. Muneeb was the highest scorer, scoring an unbeaten 42 off only 22 deliveries. Atharva’s contribution of 29 not out must also not be ignored, and as it turned out, he played most of his innings with a badly bruised foot which he apparently did not notice while batting. Great determination. Even better end to his stay in Japan over the summer. In addition to qualification to the East Kanto regional final versus Men In Blue, a place in the National Finals now welcomes us. Please come and play or support if you are available from 6-8 October. The way this season has gone, it is not wrong to expect more glory. Now let’s cool ourselves and get ourselves into our best shape for the business end of the year. Let’s finish the season on a high. It is also worth mentioning that half of our team was under 19 years of age. The club’s meteoric rise in both the Japan Cup and JCL1 this season has vindicated the Sharks’ strategy of grooming young talent. Lastly, we greatly thank the Nippon Tigers, who proved to be great opponents in the semifinal. All the best to them for the next season. A huge thanks also goes out to the fantastic umpires from MIB, Amol and Sanket. It was not just us players who had to beat the heat.